The title of my post comes from Shakespeare–Hamlet specifically. I certainly won’t get all literary on you, but if you recall your high school English class, it was Ophelia, the daughter of Laertes, who many thought Hamlet would marry after he came back from University. He comes home, finds his father dead, sees his father’s ghost, who tells him he was murdered, and everything goes amok from there. I think I’ve heard that 9 folks wind up dead before the play is over, one of them being Ophelia. As she descends into madness, she sort of wanders in and out through a scene, spouting off the lines, “There’s rosemary–that’s for remembrance….” Hence the title of this post. Interestingly enough (and I promised I wouldn’t get much into this herbs and health stuff) there are some studies that seem to show it does enhance memory–but that’s not really the point of this post. For me, rosemary (rosemarinus officinalis) is an herb for meats, veggies, stews and even just for lovely container plantings. 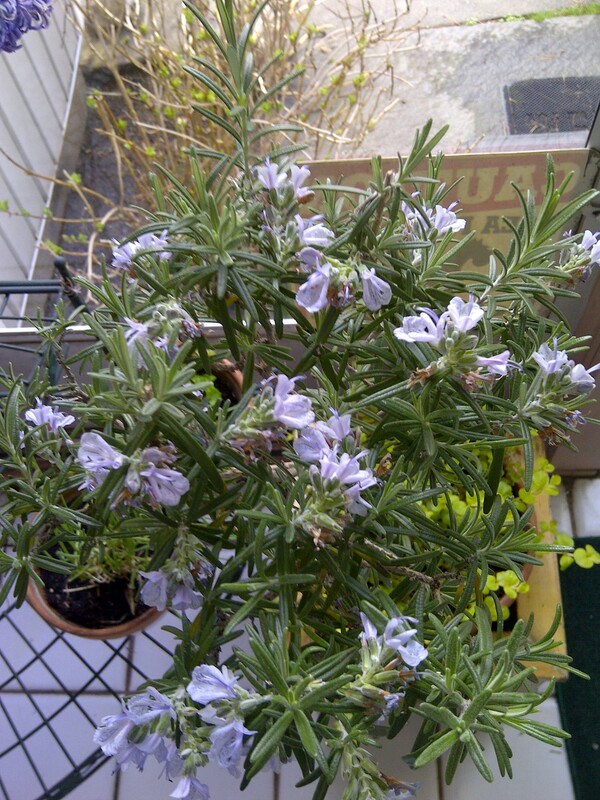 Rosemary is definitely one of those Mediterranean herbs I talked about–it likes it hot and dry–so no shade for this plant. For me, it is not hardy, although there are allegedly some hardy cultivars that will grow this far north. Since I can over-winter the non-hardy cultivars on my sun porch, I don’t worry too much about trying to find a protected spot for an allegedly hardy cultivar (in my wet clay, it probably wouldn’t survive anyway since the wet spring would most likely kill it). The above photo is of a rosemary topiary that I made and have grown for several years. It’s obviously very happy because it’s in bloom and has been since January. 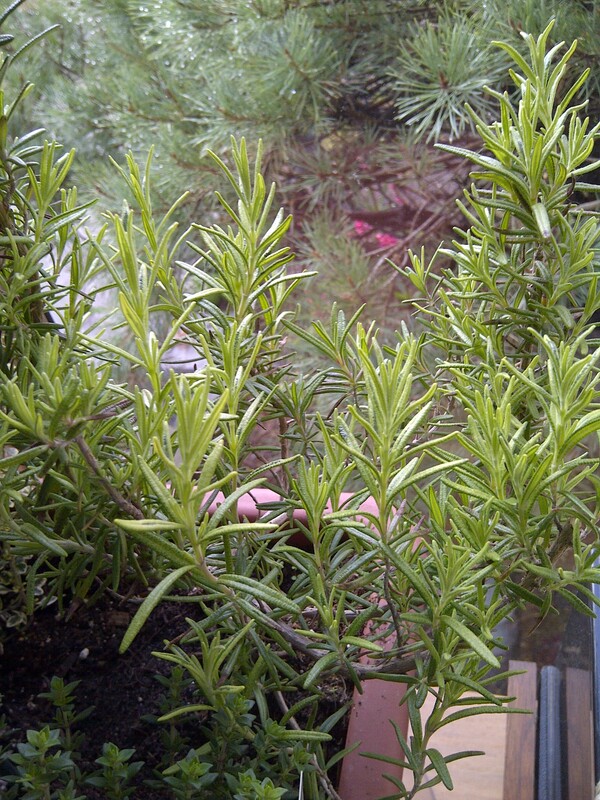 When I cook, I use this other rosemary, a golden version that I also over-winter–I probably have for at least 3 winters. It’s in that mixed planter with the thyme that I posted about a week or so ago. Rosemary is good on almost everything–it’s just up to you to decide what you like it with. It’s great with chicken, it’s delicious in pot roast, it’s good on some heartier fish dishes, it wonderful on vegetables, especially roasted winter root vegetables–there’s very little it doesn’t taste good on. A little goes a long way because it is a strongly flavored herb, though, so if you are buying a plant and it isn’t going to be hardy for you, don’t necessarily invest in a large one until you’re sure you like it on “everything” as I put it. I just chop the little leaves (that look almost like pine needles) finely and use them in whatever dish I’m making. I find I do use rosemary more in winter dishes–which seems odd since it isn’t a plant that would be naturally hardy for me–but I’m sure it would pair nicely with summer dishes as well. It’s just with so many other herbs around in the summer, my rosemary takes a back seat to my basil, for example, until that hits the compost heap!